Two posts previously I was freakin’ out man. Now I am chillin’, man. ABOVE: I had started to refinish the trim and ended up with wood WAY lighter than I had intended. So, yea, FREAK OUT! ABOVE: You are looking at three coats of amber shellac, top. The vertical trim piece to the right is still bare (no shellac). The shellac was effortless. And the trim got darker. I am happy with the look, although suspect it is lighter than it would have been in 1894. So, no sure thing, yet. ABOVE: Here, I did not use paint stripper as previously, but denatured alcohol. This did not make the trim as light. Tomorrow I will put on a few coat of shellac. This will darken the trim. And I suspect that the effect will be just right. If so, a big WHEW. 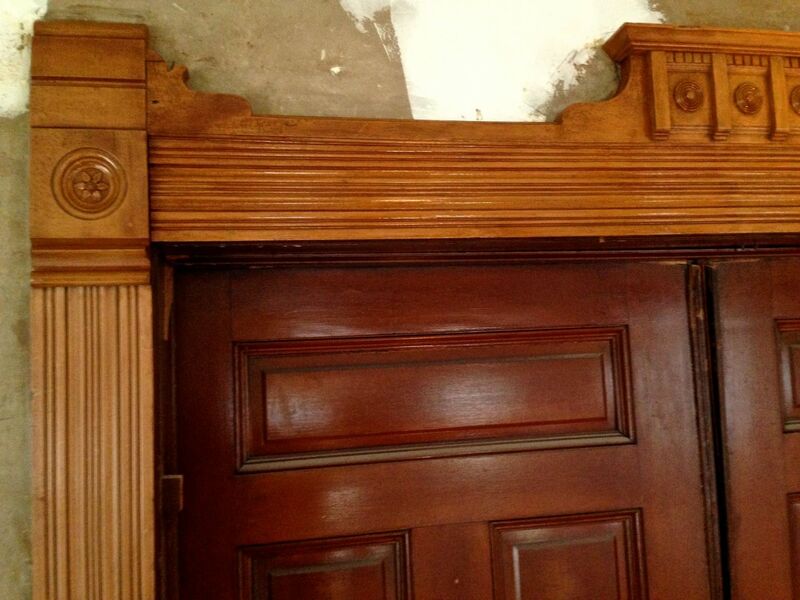 4 Responses to Refinishing The Wood Trim. PART 3. I’d also think this stuff darkened a LOT over the past century! The most stunning example is our faux-finished front door. It’s faux oak (over larch) and clearly original, very alligatored. The bulk of it has the deep reddish hue you’d expect on such old woodwork. Except the previous tenants had a “Beware of the dog!” sign on that door for the better part of the door’s life. And underneath that sign the finish looks like natural oak, much lighter! Apparently someone applied some kind of varnish over the original finish and that additional (rather thick) coat darkened and yellowed, giving that specific hue. I’ve also seen faux-finished doors with so many layers of shellac and grime that they were almost black! 100+ years of dust, soot from fires, grime from hands, cleaning and refinishing attempts can do just about anything to a finish! 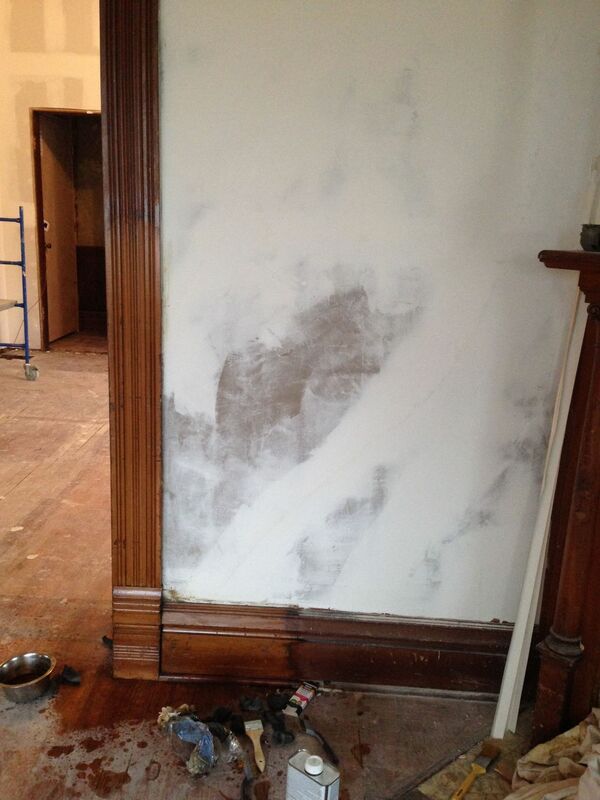 I came across this blog post while looking for solutions to expedite paint removal on some very similar trim in my 1900s craft house. I am currently using a combination of heat (heat gun) to remove most of the several layers of paint, followed by a methylene chloride based product (scraping, steel wool, wire brushes) to get the residual out of the deep grooves, then sanding the basewood which I intend to then bleach (with wood bleach) for residual stain and prep for re-staining. The trim features on my home have fewer (thank god) deep grooves on the verticals and caps. The original plan was to remove the baseboards and do this process on sawhorses, but the baseboards are actually nested behind and below the grade of the maple hardwood floor, with long square head nails going into the plaster. 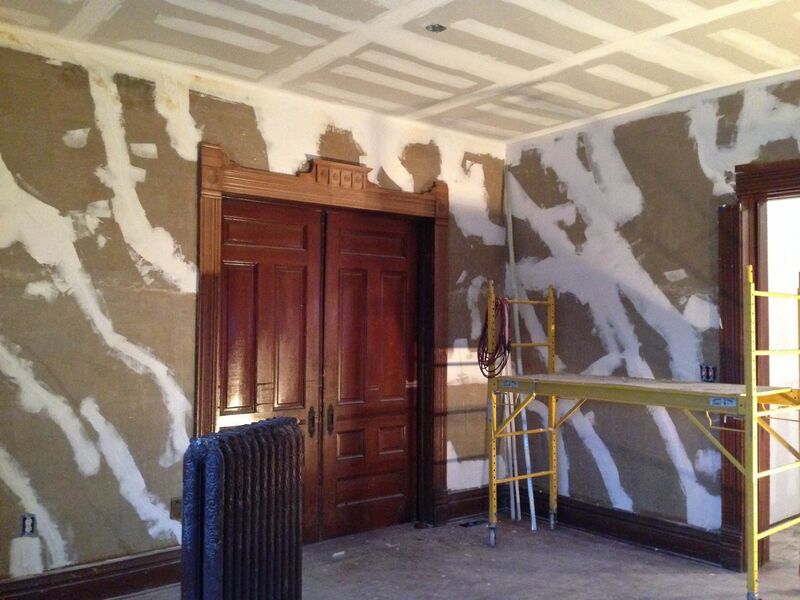 Removing them is nearly impossible and is damaging the plaster. The process of stripping them in place is incredibly time consuming; I was just wondering if anyone had any suggestions to expedite? Is this process the best method? The trim itself appears to have a light reddish hue, but I haven’t bleached it yet so it might actually be something different. I would like to get to a color that would be historically accurate but not clash with the natural finish on the maple floors. Is the amber shellac the way to go?